Each time I have lost myself in the beauty of music, Polyhymnia has been whispering in my ear. Her name is derived from the Greek, “poly” meaning “many” and “hymnos” which means “praise. Her name is alternately spelled Polymnia. She is attributed with many gifts and depending on the territory of Greece that she oversaw, her garb and visage was adapted. Her primary creativity flowed through music, song and dance and in the more traditional sense she became the muse specifically of religious hymn and praise. Unlike her sisters, Polyhymnia was depicted as more pensive in her demeanor and of an almost meditative and spiritually charged seriousness. She was a daughter of Zeus and Mnemosyne, the Titan Goddess of memory and remembrance as well as attributed as the inventress of language and words. What more beautiful expression of her mother’s gifts than to be the child that brings adeptness and creativity to the sacred words of devotion and hymn. Polyhymnia was consort of Oeagrus, the King of Thrace. In some myths he and Calliope or Clio were the parents of Orpheus. In others, Polyhymnia is appointed as the mother of Orpheus. This gives testament to the cross over and threads of community that the Muses held. All having many of the same gifts, but their expression and who they were attached to in the mortal realms meant that as mothers or aunts, the shared the parenting of many of the offspring attributed to one muse or another. In other myths she is identified as the mother of Triptolemus, the first priest of Demeter and inventor of agriculture and working the lands. This birth was by her union with Cheimarrhus, the son of the Greek God Ares. “Polyhymnia, because by her great (polle) praises (humnesis) she brings distinction to writers whose works have won for them immortal fame…” 1. Not much has been written of Polyhymnia, in contrast to her sisters. Nonetheless, she remains a muse whose essence continues to flourish with each writing and composition of any work of devotion. So the next time you are inspired by song or feel the rising of your Soul’s desire in response to music’s harmonious flow, offered up gratitude to Polyhymnia as she whispers gently in your ear. 1. Diodorus Siculus, Library of History books III-VIII (trans. Oldfather) (Greek historian C1st B.C.). For some, it wouldn’t be Beltane without dancing around the Maypole. While not everyone gets to have a 20-foot pole sunk into a 3-foot hole in the middle of a field, everyone can have a mini version on their altar. You just need a dowel or stick about a foot long, a base and ribbon. Let a stick find you, or buy a dowel about a foot long. You will also need a base: a piece of wood from the craft store, a slice of a thick branch or a mound of air-hardening clay. Use a screw, nail or glue to anchor one end of the pole to the base. An old wooden paper towel holder might also work. Children could use Tinkertoys. Cut ribbon of various colors at least twice the height of the pole and glue or tack to the top. If desired, put a bead on top to finish and decorate the base, perhaps with a crown of flowers. 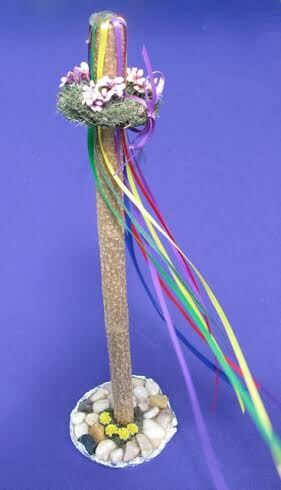 This Maypole can be placed on your altar or holiday table. You can braid the ribbons as a ritual or just let them hang. This Maypole has been a Beltane decoration at the Church of Eternal Light in Bristol, Connecticut for longer than some people can remember. All the parts for a Maypole can be found at a large chain craft store.